I don't know about you, but in the midst of all the noise and advocating and all...I need to take a break. And being a visual person, that usually means finding a way to get out and stare at the horizon, the sweep of the ocean, or even just the amazing painting-like bark of our Stewartia tree. Something to remind myself of that to which we're connected. But yesterday, as if by magic, I followed a link trail that eventually led me to this. Now, I won't go on philosophizing here, but suffice it to say that looking at our planet from a scale that makes us all but invisible gives me a combination of thrills, and chills. 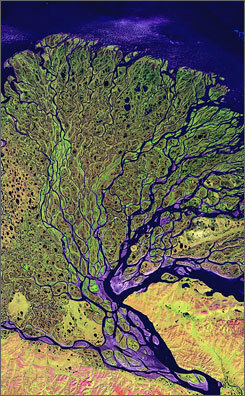 I'm awed by the unspeakable beauty that appears in the patterns and colors of Earth from space. So natural. So immutable. But it comes with a bittersweet taste, a reminder that even from these distances can we tell that all is not well. Something in me wants to cry: don't touch the art. p.s. Thanks to USAToday.com for the tip. The photo above appears courtesy of the Smithsonian, via AP.